A splashback is an essential item when designing your kitchen in order to prevent grease and food staining your walls when cooking. Instead, a splashback provides an easy-to-clean surface that can be quickly wiped down after cooking, ensuring your kitchen stays looking spotless all the time. Glass splashbacks are an increasingly popular choice to the tile alternative, providing an easy to install surface that is not only quick to clean, but looks great too. 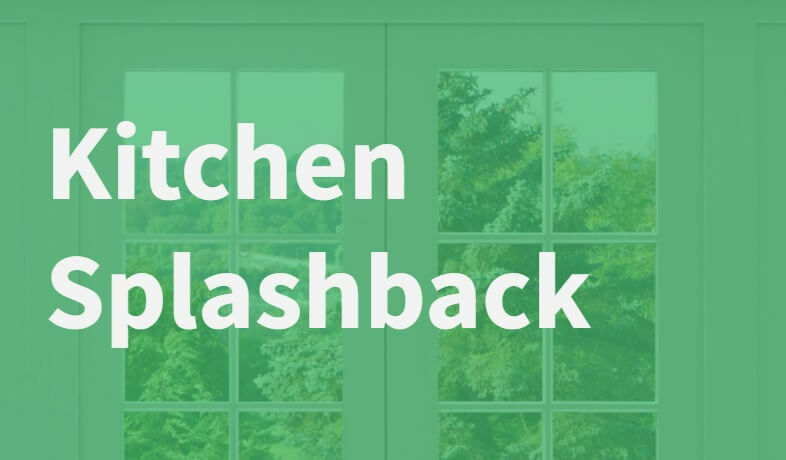 We’ve listed a few of the reasons why a glass splashback makes an ideal addition to any kitchen below. The main function of a glass splashback is to protect the paint on your walls from staining with food and grease while you’re cooking. A bit of mess when making dinner is inevitable, but with a glass splashback any splatters are easy to clean up in a matter a seconds. Glass can be cleaned with a simple glass cleaner, and the smooth surface ensures a quick clean up every time. Glass is extremely versatile, and can be made to order according to your kitchen’s colour scheme. So whether you want a subtle protector, or a bold piece to stand out in the kitchen, you’re sure to find a colour that will suit you. Tile splashbacks have been in favour for years, and these can now look dated or plain in a kitchen. Glass adds a modern edge to your home, providing a new and exciting look that could transform your kitchen – sleek edges and high-quality finishes are a popular look for kitchen designs currently. A common problem with tile splashbacks is that the combined humidity, constant exposure to moisture, and grease, can easily cause the grout to mould or stain. This will result in an unpleasant look for your kitchen, and often is only solved by re-grouting the entire surface. One of the biggest benefits of glass, then, is that the chances of mould growing on it are nil! The surface will stay smooth and clean provided you regularly wipe it down. Being placed directly behind the stove requires a splashback to be able to withstand high levels of heat. Specially engineered splashback glass is durable enough to take extreme levels of heat, meaning you can turn up the stove without worrying about the effect it has on the surrounding materials. Here at Abbey Glass, we have the facilities to provide our customers with glass cut to suit their requirements exactly. We’re committed to ensuring that our customers receive high quality service, every time, and at cost-friendly prices. Contact us today for more information, or for some prices on our glass products, and we’ll be happy to help.